This ROGERS® SP60GR is a 60-ton capacity lowboy equipped with the patented "No Foot"® detachable gooseneck and a 20" loaded platform. The rear frame features the 16º "Gentle Riser" with 3 fixed axles and a removable 4th axle. The "No Foot"® gooseneck comes complete with a built-in "hat box" (the slight slope on the underside) for tractor fender clearance and a hydraulic jack that contacts the tractor's frame rails. Powerful hydraulic cylinders allow the rated load to be lifted anywhere on the deck using low hydraulic pressures. There is no need to use a gas engine or a special 3,000 psi PTO to detach this trailer. Notched cross members in the main deck for better overhead clearance of of an excavator's boom. The recessed cover plate in the center rear frame reduces road spray. Wood-covered toolboxes provide storage in the deck for chains and blocks. This space also has stores the battery for the self-powered auxiliary light system. The tri-axle has reinforced tread plate wheel covers. 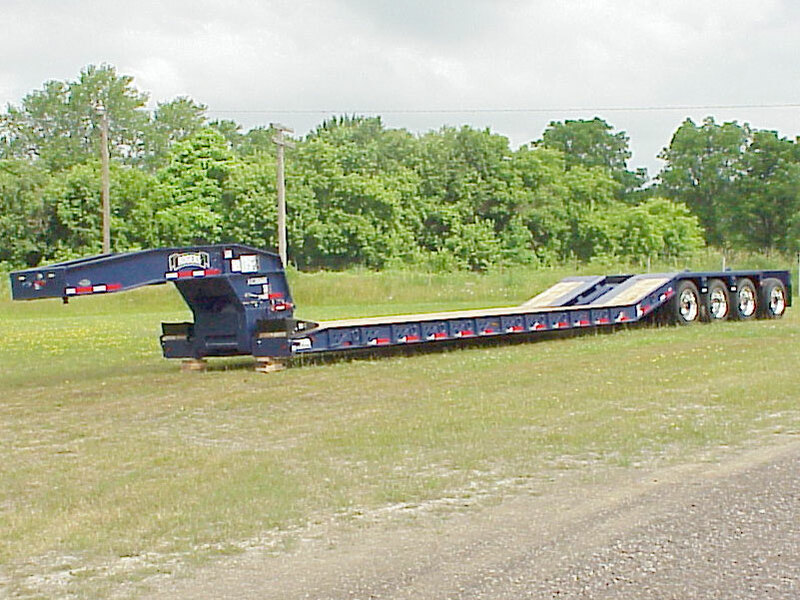 A Removable 4th axle helps the trailer meet state weight regulations where needed.